Muslim groups observed 'day of sorrow' while Hindu outfits celebrated 'shaurya divas' on the 23rd anniversary of Babri mosque demolition on Sunday, which passed off peacefully amid tight security in Ayodhya, as well as in other parts of the country. The Babri Masjid Action Committee observed the day as 'Yaum-e-Gham' (day of sorrow) while VHP observed 'shaurya divas' (day of victory). On the occasion, Uttar Pradesh's Additional Advocate General Zafaryab Jilani, who is also a BMAC member, said that the battle for Babri mosque is being supported and fought by Hindus. "The case of Babri mosque is being pleaded in Supreme Court by a group of eminent lawyers who are members of Hindu community," Jilani said in Ayodhya. "We are fighting the legal and political battle of Babri mosque on the support of 90 per cent of secular Hindus of the country," he said. Muslims in the twin town of Ayodhya-Faizabad observed black Sunday. Incidentally, the mosque was razed on a Sunday on December 6, 1992. People of the Muslim community did not open their shops and hoisted black flags to protest against the demolition of Babri mosque. 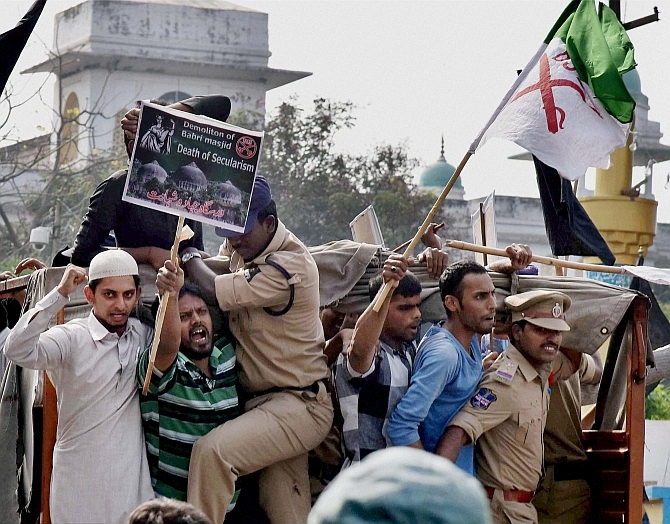 Indian Union Muslim League observed a 'dharna' outside SSP office in Faizabad. Meanwhile in Delhi, members of Bajrang Dal and Vishwa Hindu Parishad pleged to work for early construction of Ram Temple at Ayodhya as they marked the day as 'Shaurya Diwas'. VHP Delhi President Rampal Singh said the temple should be build through an act of Parliament. "Trusting the judicial system, Hindus waited for 60 years from 1950 till 2010. But now the Hindu community wants the temple to be built throgh an act of Parliament on the lines of Somnath Temple," Singh said. In Punjab, activists of Shiv Sena observed the anniversary as 'Shourya Divas' by holding a function in a local temple in Phagwara. 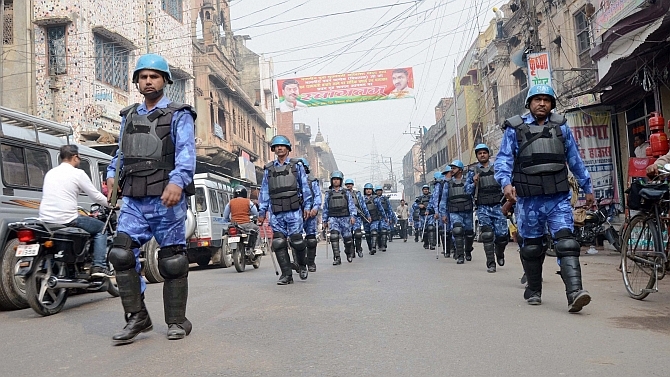 In Hyderabad, a bandh called by All India Majlis-e-Ittehad-ul Muslimeen and other local outfits passed off peacefully and no untoward incident was reported in the city, police said. In Kolkata, ruling Trinamool Congress organnised a rally near Gandhi statue in the heart of the city to mark the anniversary as 'Sanhati Divas' (Unity Day). "Ours is a democratic and secular country, there should be an atmosphere of brotherhood among all and everybody should be able to live freely," party MP Sudip Bandopadhyay said at the rally. "Nobody should attempt to decide who will eat what," Bandopadhyay said referring to the recent controversy over beef eating. On the occasion, Left parties today held a protest rally in New Delhi and accused RSS-BJP of whipping up communal passions in the country. During the rally, CPI (M) general secretary Sitaram Yechury dubbed Hindutva organisations as "anti-national" and accused them of not only disturbing peace, but endangering scientific temperament in the country. Meanwhile, UP minister Tej Narain Pandey said that even after 23 years of the demolition, those responsible for it have not been punished and not even court proceeding has reached to that extent so we can believe that the accused will be punished. Jilani also referred to various legalities involved in the case. He also appealed to Muslims to remain patient as their case has a strong footing in Supreme Court.